Rio Grande Gorge Bridge, also known as “High Bridge” is the fifth highest bridge in the United States at 650 feet.. The bridge was dedicated in September 10, 1965 and was named the “Most Beautiful Steel Bridge” in 1966 by the American Institute of Steel Construction. 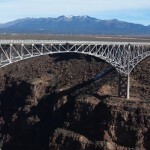 The structure is 10 miles from Taos, New Mexico and spans 1,280 feet over the tiny Rio Grande River below. Sidewalks along each side provide spectacular views, see below.